Any kitchen remodeling ideas will need to include a better service or work triangle between the sink, refrigerator, and stove placement. The shorter the sum of the triangle legs the more efficient the layout. Twelve to fifteen feet is an optimum size for efficiency. Islands can also be incorporated into the design to increase your functionality. The prep sink within the island can become it's own focal point of the work triangle reducing the duties of the main kitchen sink. The orientation of the island toward the work triangle is very important making sure traffic can still flow freely within the designated triangle. Islands can contain all sorts of special storage areas. Mixer lifts, produce storage drawers, pullout shelving, divided drawers, wine storage, and dough board pullouts are just a few of the many useful aspects that can be incorporated into the island or peninsula. When you are replacing your old cabinets during a kitchen remodel with some new fine cabinetry or perhaps you are just needing an updated work surface there are a few choices that need to be considered before making your final decision. Plastic laminates, solid surface material, granite, quartz, stainless steel, wood, and concrete are the most popular choices today when considering new or replacement counter tops for a fine kitchen upgrade. Each surface has it's own set of pros and cons to take under advisement before a conclusion is reached making sure your selection blends with your lifestyle. Remember that any samples of materials you see are only small representations of any larger piece when choosing products. Furthermore protection from heat sources and cutting boards should always be used no matter which top you choose. Kitchen upgrades and bathroom remodels return the most money at resale on the initial investment of the remodeling project. National averages show that kitchen remodels recoup around 70% of the costs of the upgrade at the time of resale. However, your kitchen remodeling costs should never exceed 15% of the total value of your home. Here is where you need to get your thinking cap on and plan for an affordable budget that is within your means. Your material choices are very important and if you need to stay mid-level to remain in your budget then do so. The labor involved for the project will be around 1.6 times the cost of the materials used. The total budget should allow $100 per square foot for your kitchen upgrade project at a minimum. Basically, for an average size kitchen of between 200-300 square feet you can budget a minimum of $30,000 for your kitchen upgrade. There are very few DIY kitchen remodeling projects. Once the demolition is accomplished the inexperienced homeowner should consider his part in the remodel to be complete. It's time to get the building professionals involved to make sure that the resulting kitchen upgrade functions correctly. The correct electrical wiring with the new outlets and appliance rough ins should be installed within the kitchen's frame work. Dedicated circuits per the national electrical code should be wired by a qualified electrician. This will insure that two appliances can be running simultaneously without tripping any circuit breakers. The electrician will also install the needed GFI protected circuits that keep you safe around any wet areas. It's also a great time to install all the upgraded lighting fixtures with the new switching they require. Skimping on the electrical budget can cause many problems including an electrical fire. Plumbing upgrades need to be addressed and the use of a master plumber will make sure that everything functions correctly. Moving a sink over a small amount can add an additional $2,500 to your project's hard costs as it affects both the plumbing and the floor. The plumber can be sure that you have adequate water volume for any additional fixtures that will be involved. The plumber will be involved through the setting of the sink, fixtures, and all appliances requiring water to operate. When choosing a kitchen sink, whether it is a drop in model or an under mount, you can never go wrong with a good grade of stainless steel. These sinks never go out of style and you can outfit them with any color and kind of faucet finish that you see fit. Moving on to the fine cabinetry for the project, you are limited by what you have budgeted for. Traditional face frame medium grade oak or maple cabinets will cost you around $160 per linear foot. Any exotic wood species are even more costly. Special cabinet amenities like pullouts beyond the basic drawer and shelf storage will add more to the total cabinet price. 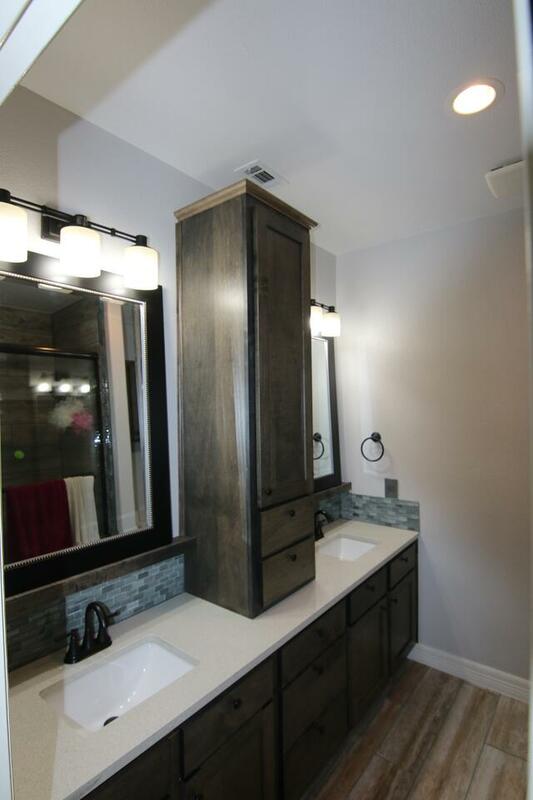 If the intent of your upgrade is to increase your accessibility via an ADA remodel as in wheelchair accessible, the new cabinets will most likely have to be custom made. These alterations should be done by a qualified residential construction contractor who is accomplished in dealing with the local ADA codes. Frameless European full overlay style cabinets are a type of fine cabinetry having either a painted or stained wooden exterior or one with the exterior totally covered on all exposed surfaces in plastic laminate per your choice of color, pattern, or manufacturer. The laminated exterior application provides a much cleaner and more modern look for easier maintenance. The doors and drawer fronts on all European cabinetry are flat having no crevices to conceal grease and grime and directly overlay the cabinet box. Each door is mounted on the inside of the box using fully concealed and adjustable two part hinges. The frameless European style is represented only by the cabinet carcass or box, composed of the walls, bottom and top (if needed), and back without any face frame components yielding only a 3/4" outward appearance for all the stiles and rails. This European style which eliminates the usual two inch face frame gives full access to any stored contents with more usable room. 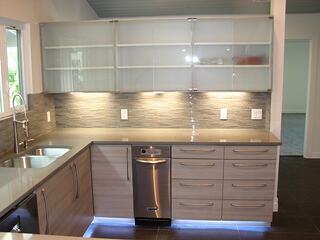 These frameless cabinets limit the amount of exposed stile and rail surface area between the door and drawer faces. 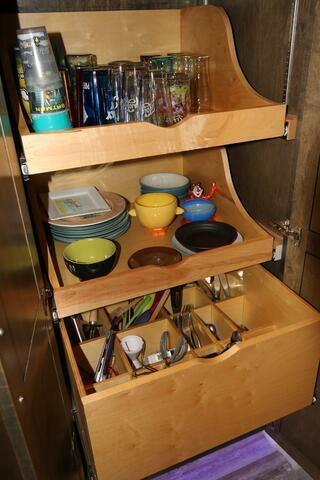 The exposed cabinet area is normally limited to 1/8-3/16 of an inch. This holds true between any two finished faces coming together presenting a half overlay situation on either a horizontal rail or vertical stile; hence, exhibiting the full overlay method. This clearance is also typical at the juncture toward the outside walls beside the cabinets. One other characteristic of the European design lies in the adjustable shelving. A series of 5mm holes are repeatedly drilled in 32mm increments (approximately 1 1/4") continuously at the front and back of all vertical cabinet pieces receiving shelves. This configuration allows for shelf supports to be inserted to adjust the shelves. In time, the shelf supporting "dogs" might wear out the holes and become loose causing the shelves to collapse. The retro use of metal pilasters will remedy the problem. 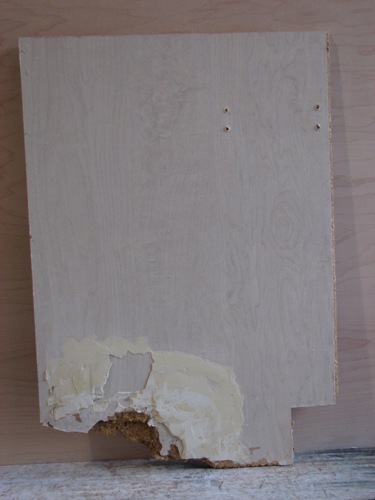 Following cabinet installation, there is no room for the application of wall trim in the European method. Spaces against the walls should be caulked in place to seal the carcass to the walls. If the gap toward the side walls is greater than 1/8 inch preventing a reasonable caulk joint, a laminated filler must be installed. This new filler should be cut and sanded to fit the taper tightly filling the gap. As mentioned above, the narrow but typical gap from the side of the cabinets to the wall can and will be a problem when European style cabinets are specified for a remodel. Don't forget that the 1/8th inch spacing rule means that no passage door or window trim can be any closer to the new cabinet faces than the cabinet drawers themselves are deep. 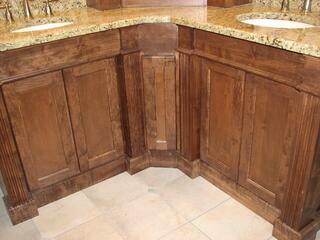 Any such trim will always be 1/2 inch or more in thickness thus impedes cabinet function. 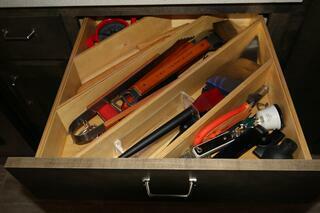 By practicing this rule of thumb you will allow the drawers to fully extend. Cabinet doors will also have a clear swing radius and not be wedged against any perpendicular entry door trim. If the above needed clearance from the cabinet faces to the door trim is nonexistent the entry doors themselves must be relocated. This aspect will include any wiring for light switches or outlets and should be done by a qualified electrician. There are many textured nonporous plastic laminates available today that will help keep your project costs in the black for the cabinet top. 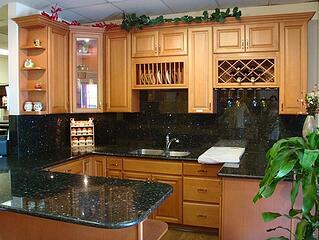 However, the premium grades of plastic laminate counter tops will still cost upwards of $45 per linear foot. Common grades of granite run around $100 per square foot including prep work like edges and sink cut outs and these granite choices can be purchased at square foot pricing. Premium or exotic granite tops must be purchased at slab pricing meaning you will end up with the remnants you don't use to complete the project. Quartz tops are somewhere in the middle and now some are becoming common stock materials in the storage yards available at square foot pricing. Back splashes can either match or be totally different from the surface of the counter top. Poured in place concrete tops are available as well as stainless steel or solid surface materials. Back splashes using tile patterns and designs must blend well with any of the chosen counter top surface choices. If you have been considering an Austin kitchen remodeling project there are a few things you should take into consideration. 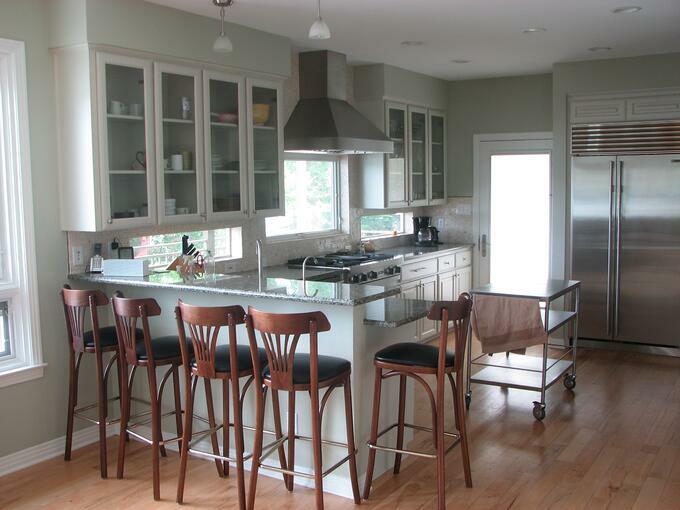 Kitchen upgrades in Austin, Texas can take on many looks and facets. The scope of work you choose to accomplish this task should effectively solve your problems and most importantly, your needs as the home owner-- for now and for the future. The identification of these specific needs belongs to you the home owner. The way your home is structurally altered to accomplish these needs is the job of the professional remodeling contractor. Aging in place and accessibility should be a concern no matter what your age and should be accomplished using Universal Design techniques. If your concerns are not for you, barring any life changing accident, they could concern the accessibility of another generation's independence is using the bathroom. A CAPS professional in the remodeling industry can help with solutions in solving these issues while performing design/build home modifications. T-Square Company is a nationally registered CAPS remodeling contractor. Both kitchen and bath remodels return the greatest result for your ROI. Whatever your situation please rely on the experiences of a local building professional. Check out their credentials and references over merely price checks against other bidders. Don't make the mistake of letting a cabinet maker subcontractor or tile installer play the part of a general contractor because his knowledge will be limited to that of the cabinets or tile and not much else. You get what you pay for with proper planning and by using an experienced and qualified contractor. 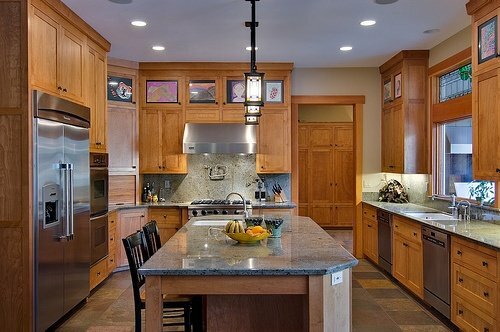 T-Square Company has over three decades of kitchen remodeling experience to help you with a design/build kitchen remodeling project. Call us today to schedule an appointment at 512-444-0097. Kitchen remodeling using fine kitchen cabinets has become quite expensive over the years and sometimes people simply run out money at the end of a large project. The unforeseen problems like faulty wiring or plumbing may have absorbed more of the allotted funds than were budgeted and you must make changes in your allowances in order to finish the job. The quality of desirability of fine kitchen cabinets for that look of a custom job may have to be realized at a later date. Ready made cabinets that you purchase and install yourself can sometimes keep you within a budget and promote the project's completion. The mere composition of any new set of fine cabinets used in your Austin kitchen remodel can either make their installation a frustrating experience or aid in the process. Harder woods like oak, maple, pecan, or hickory can be tougher to deal with because of their hardness. Drilling holes, cutting, or fitting to a tight tolerance will prove to be a harder task to accomplish when you aren't working on softer woods like pine, cherry, or poplar. Fastening can also be a problem while using the harder woods requiring pilot holes to be drilled. When installing the crown molds at the ceiling or the cove moldings in the inside corners where the cabinets meet the wall always use caution and pre-drill when possible to prevent splitting. Once you get your new cabinets home open up the boxes and let them stand in the room where they will be installed for some four to six hours. This will acclimate the cabinets to your building's temperature and humidity and help prevent the wood from moving once the cabinets are installed. Don't be surprised if you still have to make some slight adjustments to your new cabinets once they take on their new environment. Be sure that you go into a stud when screwing on the carcasses through their fastening areas. This will insure that your new cabinets will stay hung in place and prevent future injuries from a falling wall cabinet. Remodeling in Austin, Texas like most other cities includes many of the same aspects. Be sure to choose a local qualified remodeling contractor whose personality and qualifications are agreeable with you personally. You are about to undertake a very important short term relationship in your life with someone you may know by reputation only. The relationship needs to be comfortable and free flowing thus enabling the contractor's creativity level to be at it's highest during your remodeling project. Look at it as a partnership between your needs and the remodeling contractor's abilities. This is not new construction and the use of the European cabinetry must be accommodated for. His professional remodeling experience will include his capacity to identify many construction limitations and hazards. These variables underlie the major pitfalls that can be avoided while enabling a remodeling design to come to reality. His experience can also aid you in accomplishing remodeling upgrades that include disability issues. The job needs to flow between the various trades involved to produce a better final outcome. This too is a reflection on his remodeling experience for which there is no substitute.